This hotel is 100pct non-smoking. About the Embassy Suites San Antonio - NW I-10 hotel The Embassy Suites San Antonio - NW I-10 hotel is located at the intersection of IH-10 and Loop 410 in San Antonio Texas. Boasting a stylish interior and comfortable well-equipped hotel suites this San Antonio hotel offers guests an optimal location between San Antonio International Airport and the city center. Guests at the Embassy Suites San Antonio hotel will be only a few minutes away from some of the city*s top attractions such as The North Star Shopping Mall AT-T Center The Alamo Dome San Antonio Zoo SeaWorld of Texas Six Flags Fiesta Texas San Antonio Riverwalk San Antonio Museum of Art /SAMA/ San Antonio Botanical Gardens San Fernando Cathedral. Our exquisitely decorated hotel suites offer some of the most spacious rooms in San Antonio with a private bedroom and a spacious living room. Each hotel suite is equipped with Two televisions A refrigerator and microwave oven A coffee maker Two telephones with data ports A well-lit dining/work table High-speed wireless Internet access. You*ll also receive a complimentary cooked-to-order breakfast a nightly manager*s reception and even complimentary transport to and from our hotel to San Antonio Airport. And if you*re keen to taste a sample of the local cuisine in San Antonio our hotel restaurant - the Plaza Grill - specializes in some great American favorites and is open everyday. Moreover the Embassy Suites San Antonio hotel is located very close to a range of leading universities businesses military and research centres in San Antonio including University of Texas at San Antonio Trinity University University of Texas Institute of Texan Cultures South Texas Medical Center United Services Automobile Association Ft. Sam Houston Army Base. 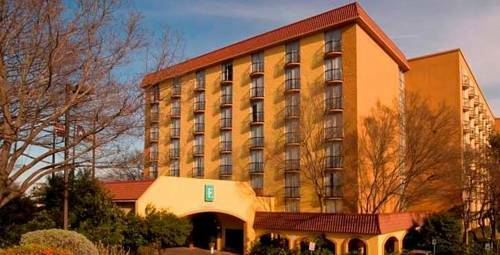 So whether you*re visiting San Antonio on business or pleasure you can rest assured that you*ll receive the best hotel stay at Embassy Suites San Antonio - NW I-10 hotel. All reservations must be cancelled 24 hours prior to arrival unless deposit req. If this reservation has been made electronically please cancel it electronically to avoid confusion and a no-show bill. Policy subject to change. The Plaza Grill offers casual dining in a sumptuous setting. You*ll be able to enjoy the best of American favorites from burgers and French fries to steak. Just let your appetite do the talking.